Before starting this company eight years ago we worked on over 120 movies. That's where we learned our craft and our work ethic. We always get the job done! Full Frame Events is the only company offering 3D 360 photos, green screen video, Gif Booths, Magic Mirrors, and Augmented Reality! Couple that with our unique green screen photography service and you can see why we are so busy. But we do so much more. We've covered events all over the world for massive international brands but are proud to say we are still highly affordable for any size event. We use the latest equipment with the very best Nikon D4S DSLR cameras, broadcast quality Canon Cinema video, wireless LED lighting systems, and super-fast laptops. We only use the very best equipment and software. With many years of experience, we can work with incredible speed, having video or photos edited and uploaded in seconds, not minutes! This keeps the whole process seamless and enjoyable for everyone, as well as allowing the maximum number of people to take part. Our service is highly flexible and we have equipment to deal with any type of green screen project. 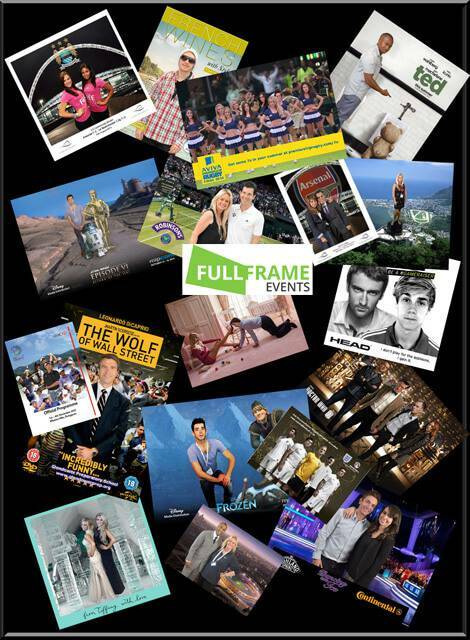 We have covered music events, car shows, major sporting events, film and advertising awards, tv shows and film premieres, corporate events, conferences, product launches, trade shows, museum exhibitions, award ceremonies and more. We own all of our own equipment so don't have expensive rental costs. Our kit is always the very best and we are early adopters of new technologies. The fact that companies like Disney, Universal, Fox, ITV, Microsoft, HSBC, Samsung, Sky and the BBC use us shows the level of quality we deliver. We have the best equipment, the most professional staff, the highest levels of experience and a great work ethic. We love what we do and go the extra mile to keep our clients happy and guests entertained. Even with all this, we keep our prices sensible and affordable. We start from just £585.00 ex-vat! So if you want something unusual at your event that will keep your guests entertained, draw in crowds and generate interest on social media, call us on 01442 255915. We have a perfect safety record along with all the paperwork like PAT tests, Public Liability Insurance, Method Statements and Risk Analysis reports to hand. Much of our kit is wireless, reducing trip hazards and our led lighting reduces fire risks. If you’re running a green screen event anywhere in the world, we can help. We know how to represent a brand and enjoy what we do. This video shows the 355 people we shot, green screened, and printed in just 45 minutes (the event was for 3 hours but we only got to work between seminars so 3 x 15 minute sessions!) When you have throughput like that health and safety is important.